Lingupedia is the App to learn and improve your vocabulary in English, Spanish, German, French, Italian and Portuguese with four learning modes, and a text to speech feature that doesn't requires an active Internet connection, so you can use the app from any place and any moment! Already tested and enjoyed by children (from 3 years old) and adults, Lingupedia is the best vocabulary learning app available for iOS, so the children can accelerate the learning and improvement of new vocabulary in their mother language. In addition, both for children and adults, the vocabulary included in the six languages supported gives an extra push to learn a second or even third language! For a better learning experience, every word is associated with a picture or pictogram, so there is a natural relation between both elements to fix the new learned term. • Learn: This section exposes all the vocabulary, where the app spells out and pronounces the word from the chosen picture in the selected language. 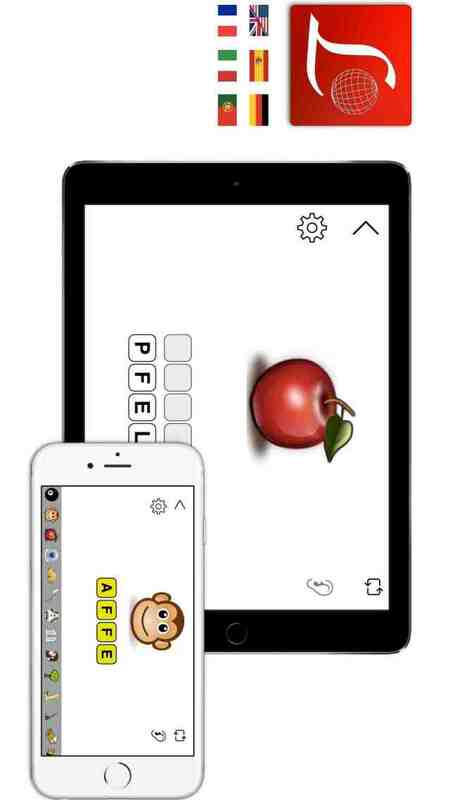 With a simple tap you can reproduce the word's pronunciation as many times as you need. The pictures are always shown in alphabetic order for the selected language, easing the scrolling of the pictograms to select the desired word. • Write: This is where you can put in practice what you've learned! Lingupedia shows the picture of a random word, and you have to drag the word's letters to their right place! This asserts that you or your children correctly identifies the word and knows how to spell it. When the word is misspelled, Lingupedia will highlight the letters out in the wrong position, so you'll have the chance to correct them. The Lingupedia's settings allow to enable special functions devoted to children who start to write. For example, it is possible to enable the Ghost mode feature to show the characters in their right position on the destination tiles, so the children just need to drag every tile over the matching ones. In addition it is also possible to enable the Lowercase/Uppercase feature, changing accordingly the letters on the tiles, in order to learn and practice the alphabet in Lowercase or Uppercase mode (the uppercase mode is more suitable for children just beginning to learn the alphabet and writing simple words). • Listening: This section is where Lingupedia randomly pronnounces a word in the choosen language, and you have to tap on the matching picture between the three available options. • Translator: This is the place where you can choose any available picture and two languages, source and target, to see how to write and listen how to pronounce the word associated with the selected pictogram. It is possible to change the settings and active language from every app mode, jumping from Spanish to English, French, German, Italian or Portuguesse as many times as you want! Unlock all your learning potential! By default as free download, Lingupedia offers a total of 23 words for the six supported languages. You can unlock a total of 226 additional words in several categories in English, Spanish, German, French, Italian and Portuguesse, as a unique purchase for just US $1.99! This is available as in-app purchase from Lingupedia main screen. Lingupedia has been carefully developed to be a 'content focused' app, with a clear and minimalist user interface, and with a negligible impact on device's battery consumption.